She studied at the Universidade Católica Portuguesa where she graduated in Business Administration and Management 1982. From 1983 to 1988 she worked in a multinational of the Pharmaceutical Industry and was responsible for the areas of Production Management, Stock Management and Prices. From 1988 until 2006 she was CEO of Livraria Barata, one of the country’s main booksellers at the time, having reached a turnover of around 5 million euros, with eight stores and about 70 employees. She was President of APEL – Portuguese Association of Publishers and Booksellers from 1999 until 2002, where she continued to be Chairman of the Board of the General Assembly until 2005. She was the first and only woman to preside this organization. 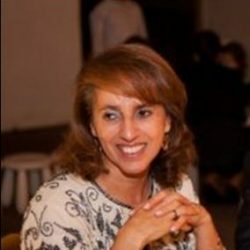 Since 2006 she has been Executive Director of the American Chamber of Commerce in Portugal.